Proud endorser of D’Addario Strings, GR Bass amps and Alperious Pickguards. 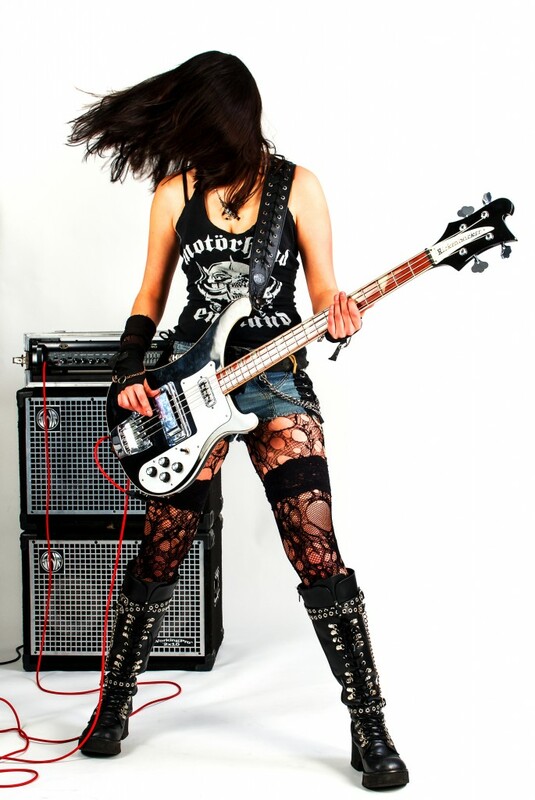 Becky Baldwin is quickly becoming one of the UK’s busiest rock bassists. After playing the piano as a child, Becky picked up the bass guitar at the age of 13 and began performing with bands at school. In 2009 she moved from Trowbridge to Bristol to study at BIMM Bristol and became closely involved in Bristol’s music scene. Becky now holds a BA Honours degree in Professional Musicianship. Becky is an energetic live performer and efficient recording musician, who specialises in fingerstyle bass guitar playing, and rock and metal genres. Since graduating from BIMM Bristol in 2012, Becky has performed at least 100 gigs per year, offering her skills for a wide variety of bands (including covers and original bands, genres ranging from metal to folk, urban, funk, pop, jazz and more.) In 2015 she made her first live appearances outside of the UK with festival appearances and extensive tours in Germany, Spain, Belgium, The Netherlands and France (with her own bands and with Bristol indie legends The Flatmates). Control The Storm‘s 2010 EP became Becky’s first released recording. 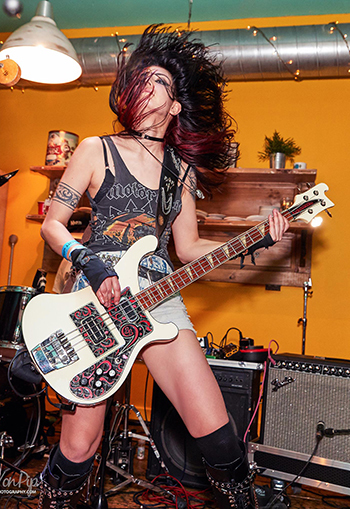 Since then, she has recorded bass guitar and double bass for Howard Sinclair‘s acoustic folk rock album ‘The Light Broke In’ released in November 2014, bass guitar on Control The Storm’s debut album ‘Beast Inside’ released March 2015, Triaxis‘ third album ‘Zero Hour’ released in May 2015, IDestroy‘s debut EP ‘Vanity Loves Me’ released in February 2016, IDestroy’s ‘Annie’/’98%’ double A side released March 2017, ‘Pure Joy of Life’ released March 2018, and Dorja‘s ‘Target Practice’ debut EP released March 2017, and DORJA’s first album ‘Gemini’ to be released in 2018. Becky has also recorded sessions for Total Guitar magazine and the Rockschool exam board (now renamed ‘RSL Awards’). Her recording endeavours have taken her to quality studios such as Invada Studos, Vale Studios, Real World Studios (Peter Gabriel), Tilehouse Studios (Mike Oldfield) and West Triad Studio in Venice, California (owned by Mark Schulman of P!nk, Cher, Velvet Revolver etc). Recordings can be found on the ‘Media’ page and releases can be purchased via the bands’ websites. Despite her young age, Becky is quickly becoming an experienced music educator. Becky is a co-founder of specialist private tuition company Bristol Rock Centre, running a teaching and rehearsal studio in Mangotsfield. She has aided exam board ‘Rockschool’ in the writing and proofing of tuition/exam books including ‘Let’s Rock Bass’, the ‘Popular Music Theory’ collection and the 2014 Vocal syllabus. She has led workshops with Bristol Rock Centre and Rockschool, and has given lectures at BIMM Bristol. Becky has received tuition from top musicians such as Stuart Clayton (Carl Palmer band), Damon Minchella (Ocean Colour Scene, Paul Weller) and Jim Barr (Portishead, Get The Blessing). Becky is a part of the Musician’s Union Wales/South West England regional committee, and was previously an active member of the MU’s Equalities Committee representing female musicians. She holds Public Liability Insurance and an enhanced CRB certificate. All equipment is PAT compliant.